This PDF 1.3 document has been generated by Word / Mac OS X 10.11.6 Quartz PDFContext, and has been sent on pdf-archive.com on 09/08/2016 at 00:57, from IP address 104.156.x.x. The current document download page has been viewed 278 times. File size: 402 KB (56 pages). resolution	which	could	be	adopted	in	other	communities. 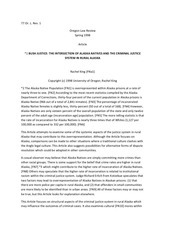 Alaska,	[FN7]	*3	which	might	contribute	to	the	higher	rate	of	incarceration	of	Alaska	Natives. be	true,	but	this	Article	looks	for	explanation	elsewhere. suggests	some	possibilities	for	reforms. 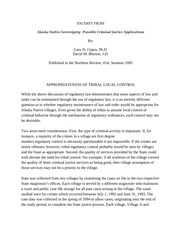 differences	both	between	the	Native-Alaskan	cultures	and	the	court	systems	in	each	area. true	objectivity	is,	of	course,	impossible. the	criminal	justice	system	who	may	be	able	to	improve	the	justice	system	for	all	Alaskans. rate	of	conviction	of	Alaska	Native	defendants. bad	weather	interfere	with	communication. practical	given	my	caseload	to	travel	more	frequently. client	was	limited	to	writing	and	the	one	visit	she	made	to	Ketchikan. evening,	about	twelve	hours	after	boarding	the	ferry. homestead	lacked	indoor	plumbing,	electricity,	or	a	telephone. the	trip	to	Whale	Pass,	the	result	may	have	been	otherwise. office. Often,	they	could	not,	so	we	met	right	before	the	court	date,	or	not	at	all. was	already	in	session	on	the	record. clients	to	seek	advice	about	their	cases	from	the	district	court	magistrate	or	the	local	police. accessible	only	by	boat	or	plane. [FN21]	The	same	pretrial	communication	problems	existed. southeast	villages,	many	clients	did	not	have	their	own	telephones. my	client	with	stealing	the	purse	of	the	assistant	district	attorney's	wife	and	forging	checks. the	judge	was	trying	to	decide	whether	to	accept	his	plea,	he	kept	asking	me	what	I	thought. prosecutor	told	me	he	was	angry	with	me	for	my	remarks. made	regular	travel	to	the	villages	impossible. constraints. Although	she	was	from	Noorvik,	the	alcohol	treatment	center	was	in	Kotzebue. get	there. Pauline	was	usually	broke,	so	traveling	around	the	Arctic	was	difficult	for	her. reuniting	with	her	children	was	always	outside	her	grasp. Most	Alaska	Natives	speak	English,	although	it	is	not	necessarily	their	first	language. people	speaking	the	same	language. about	them	that	affected	my	ability	to	establish	a	rapport	with	my	clients. differed*12	vastly	from	my	experiences. You	are	a	character	in	every	other	person's	story. You	know	the	stories	of	every	person's	life. culture	and	cross-cultural	communication	problems	within	the	Anglo	criminal	justice	system. how	I	handled	the	case. very	close	proximity	to	him,	and	they	would	not	see	me	again	any	time	soon. This file has been shared by a user of PDF Archive. Document ID: 00411689.